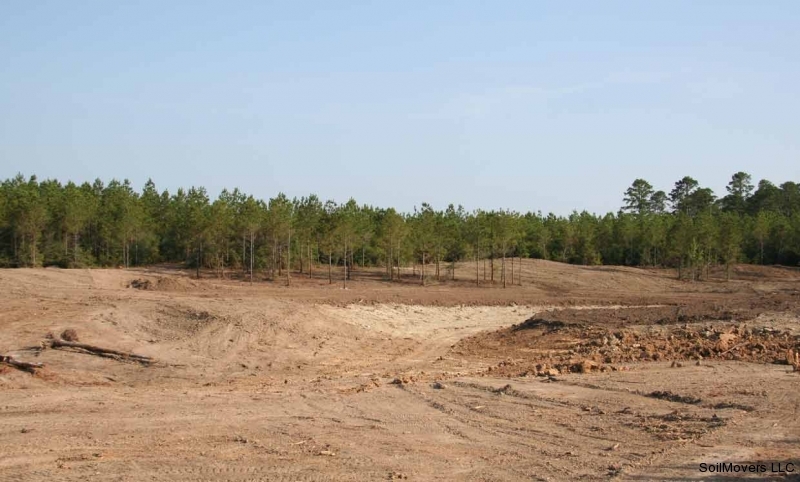 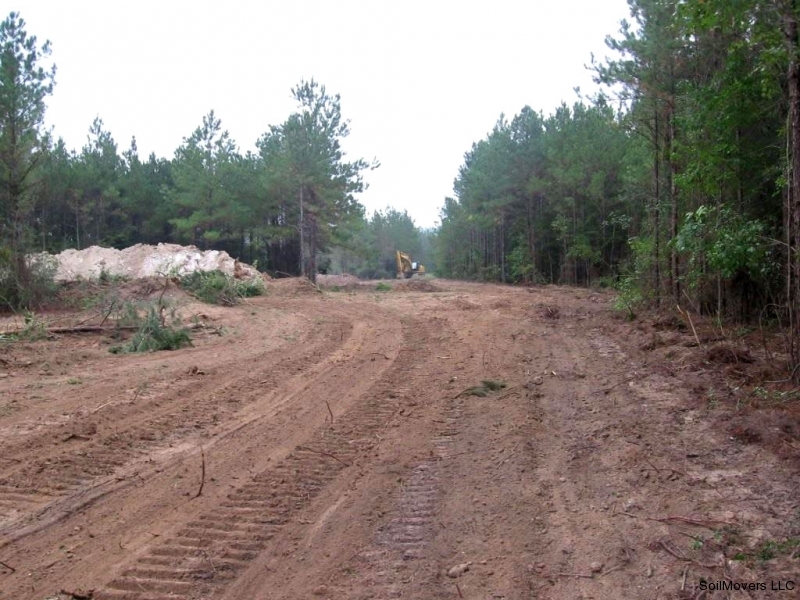 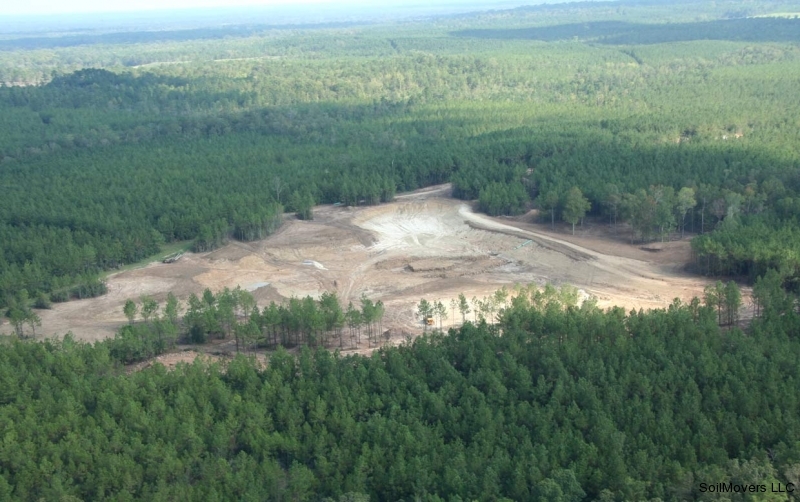 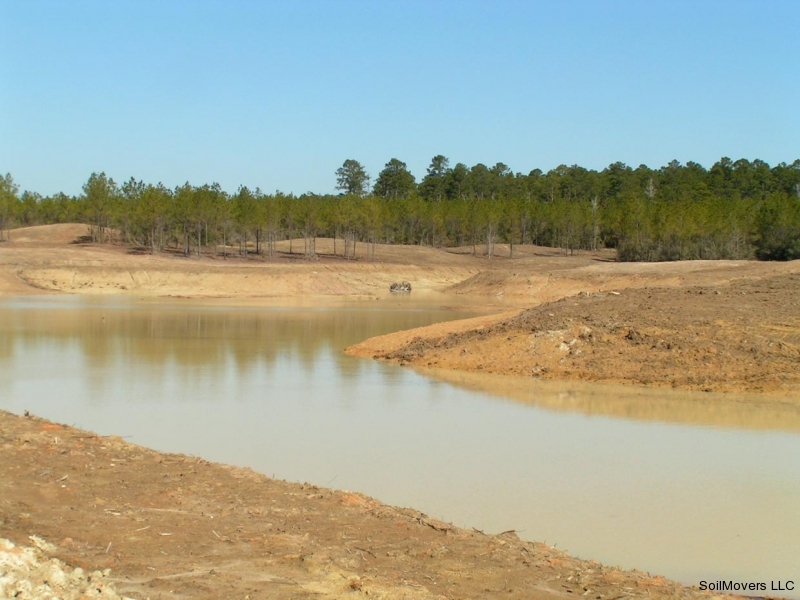 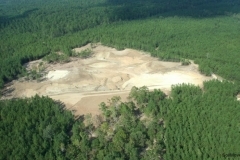 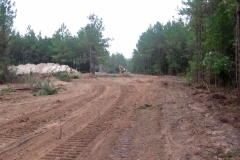 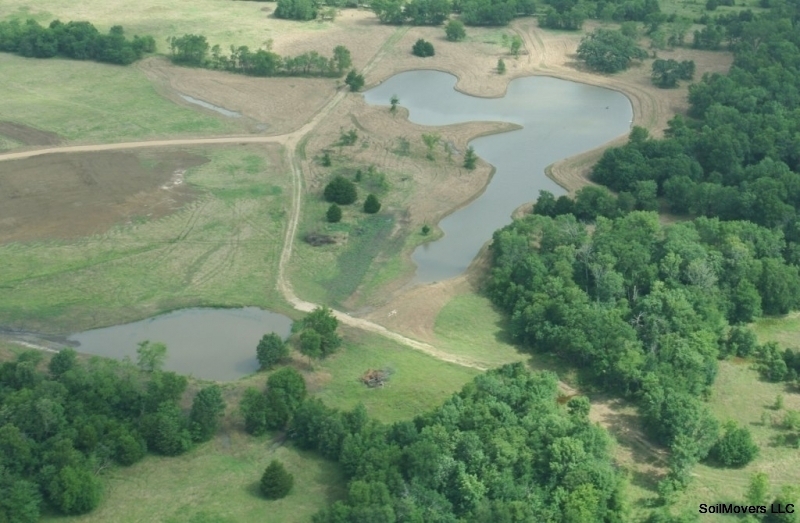 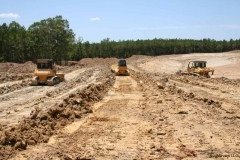 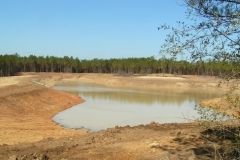 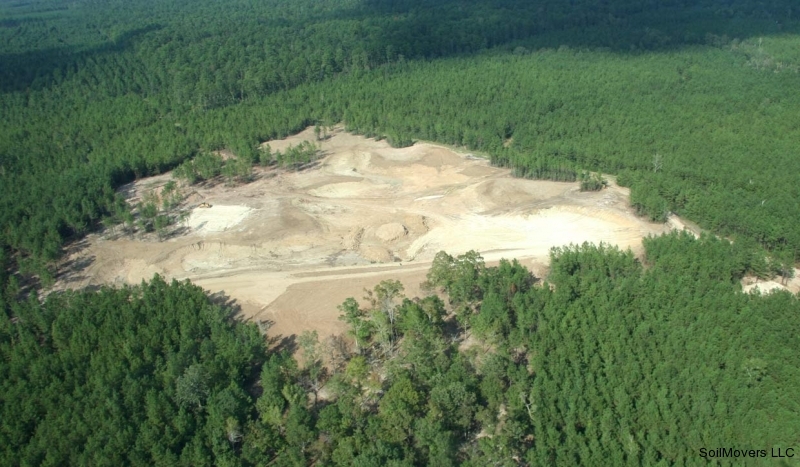 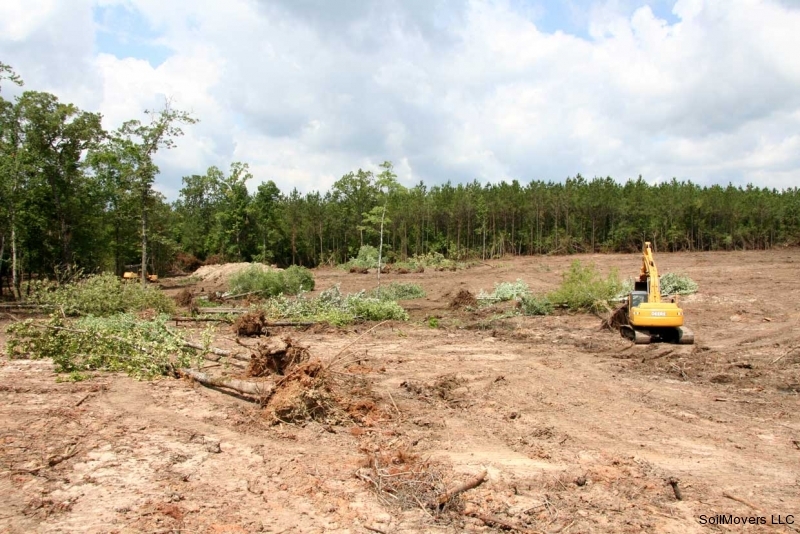 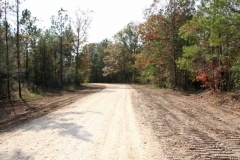 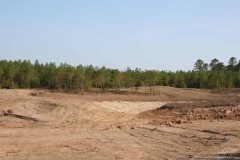 Near Newton in the East Texas Piney Woods – Complete Infrastructure Project and Large Recreation Lake. 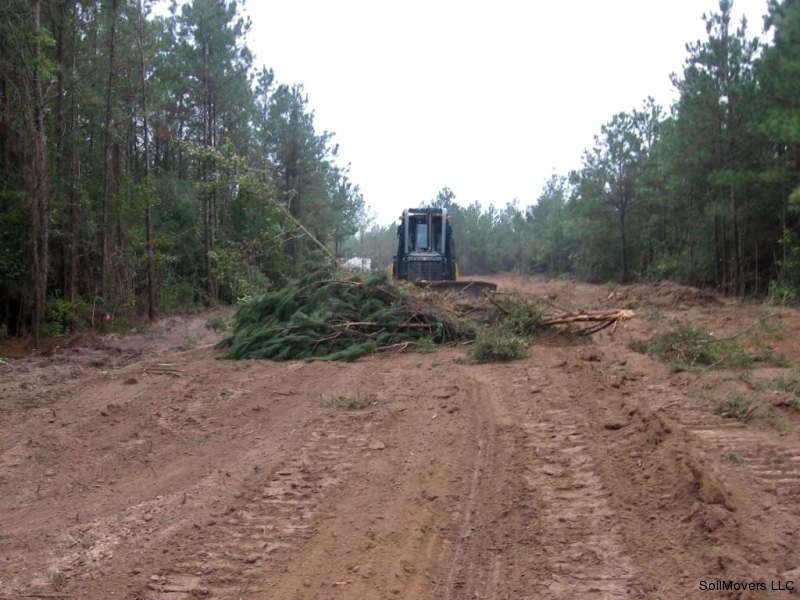 One of our favorite types of project… Take 650 acres of raw pine timberland and transform it into a weekend getaway for 2 families. The agenda includes graveled ranch roads, utilities right of way, land clearing, house sites, brush removal and a large recreational lake. 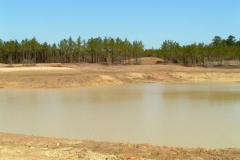 The finished recreational and fishing lake will be approximately 7 acres which is almost as large as 6 football fields. 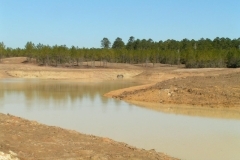 This is a BIG lake. 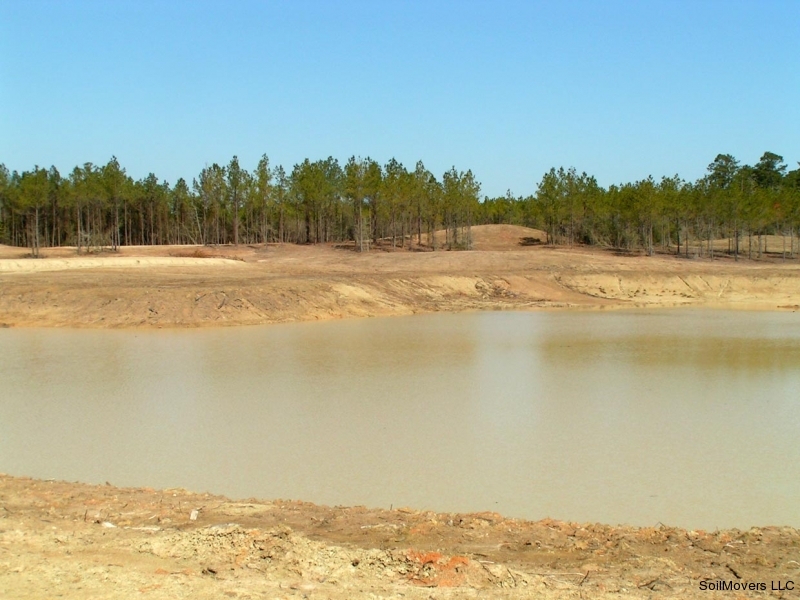 These pictures are a good tutorial for a straightforward recreation lake project. 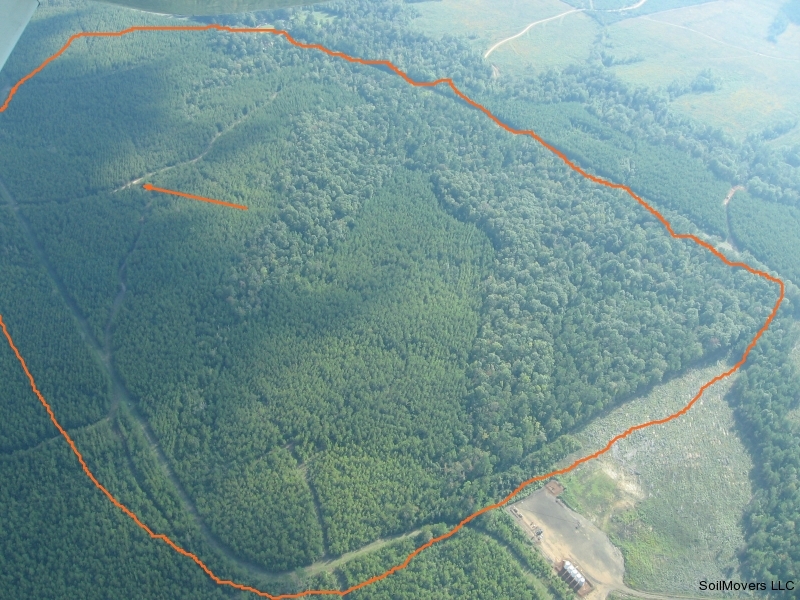 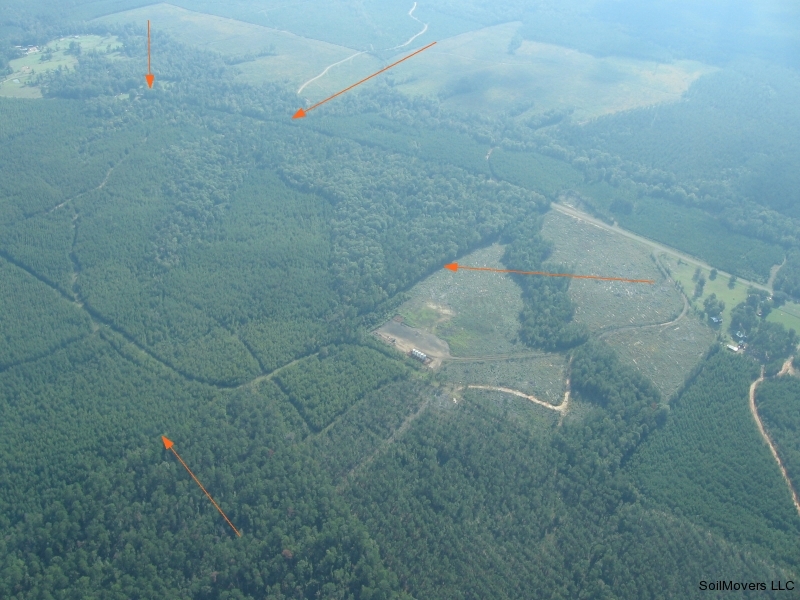 Red arrows point to the 650 acre tract. 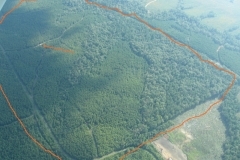 650 acre tract outlined in red. 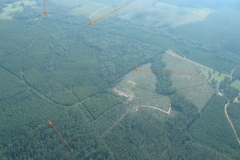 The arrow points to the RV parking base camp area. The lake will be placed in one of the hardwood erosion management areas which appear as taller trees. A hardwood management area is a watershed management area that was left when the tract was logged by a timber company and replanted in pine trees. 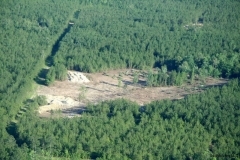 Access road cut into the piney woods from the county road. 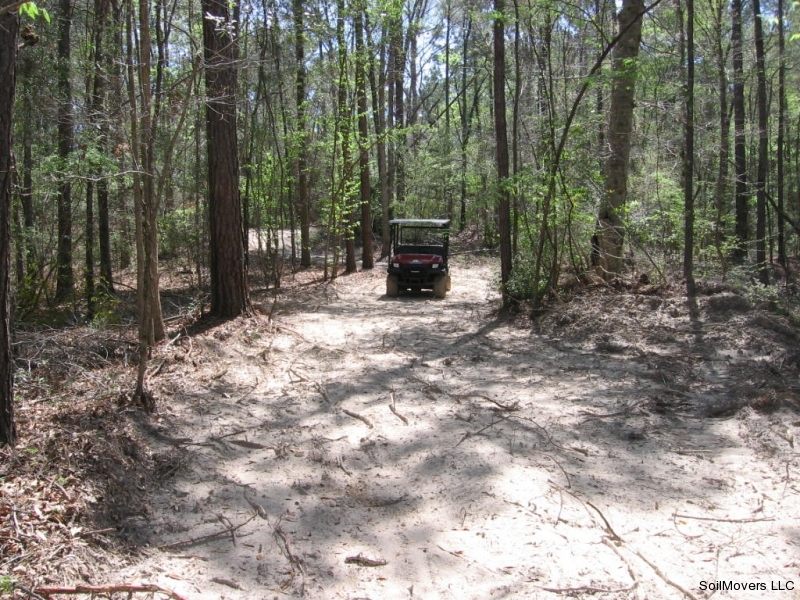 All weather access to a small portion of the property for people and equipment is a priority. 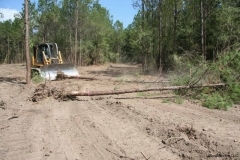 The power right of way for underground utilities was also cleared at the same time. 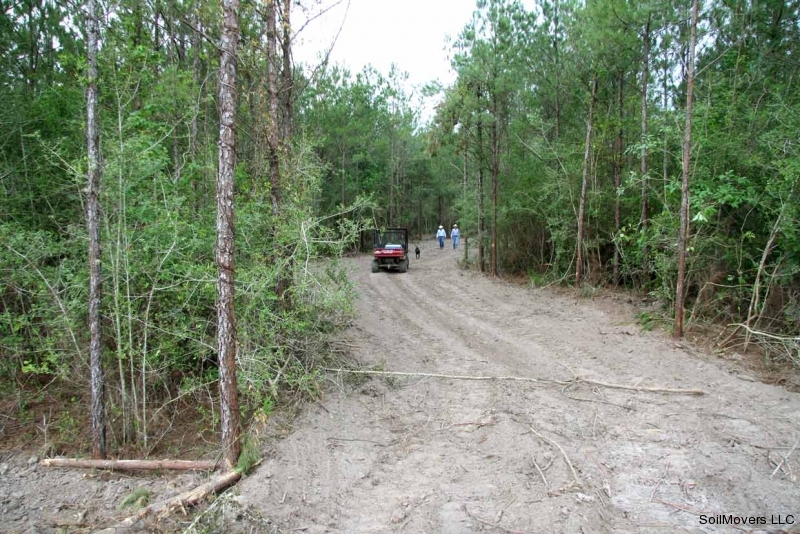 Trails are cut through the thick brush to allow for exploration and future access. 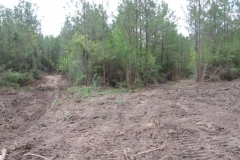 The existing brush was impenetrable and the land owner had no idea what the property really looked like. The trails allow us to narrow down the most suitable area for lake construction. 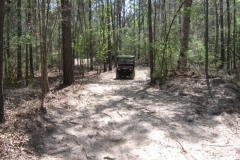 With over 4 miles of trails cut through the property, the owner can evaluate and explore in areas previously inaccessible. 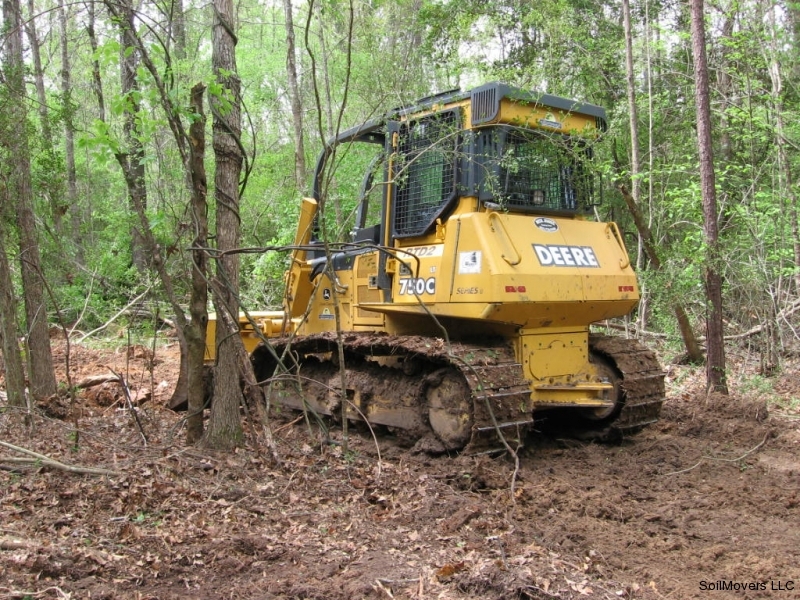 The brush was so dense in some areas a GPS was used to guide the bulldozers in order to connect the trails. 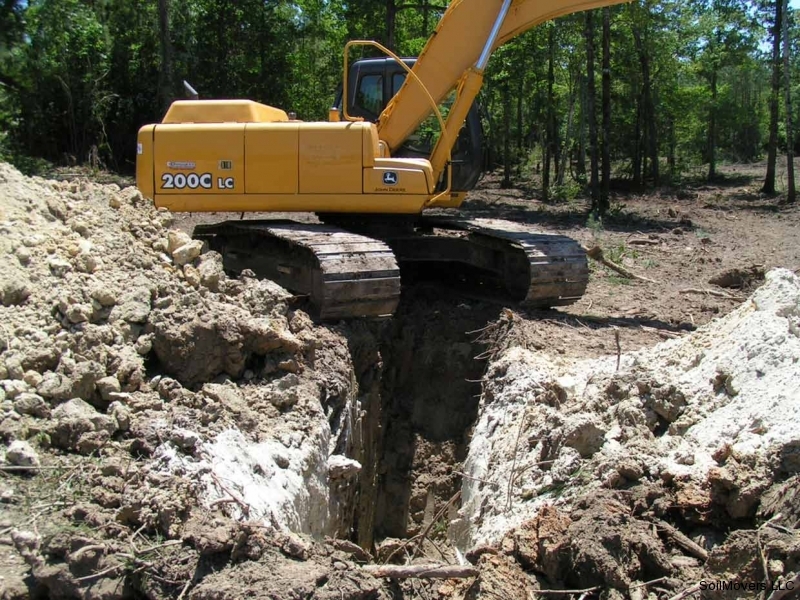 Test holes are then dug in desirable areas to determine soil suitability. 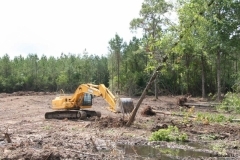 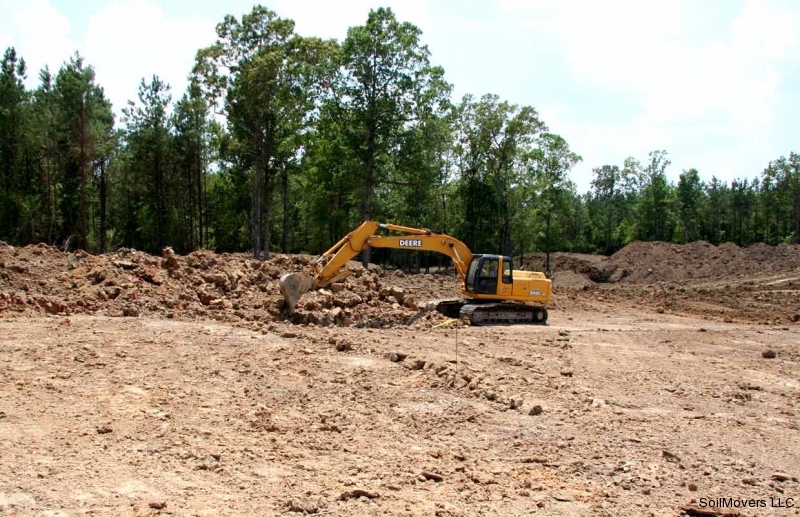 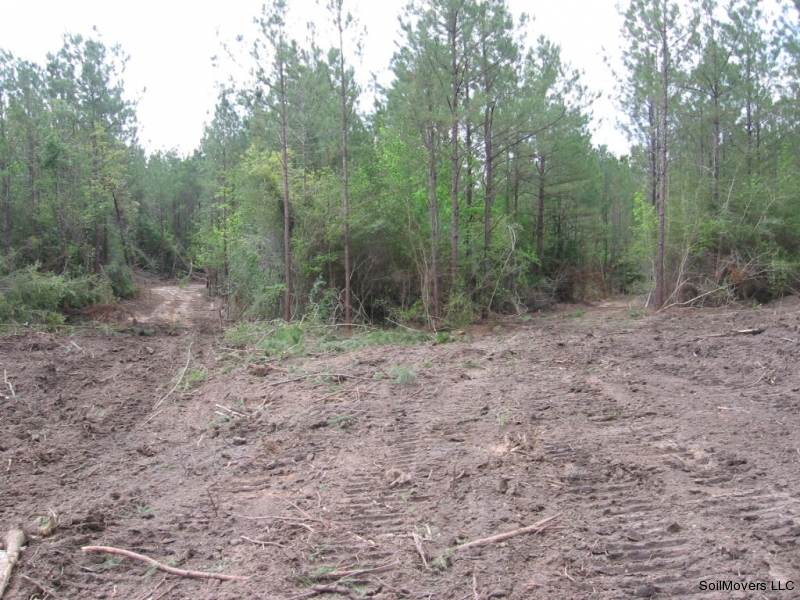 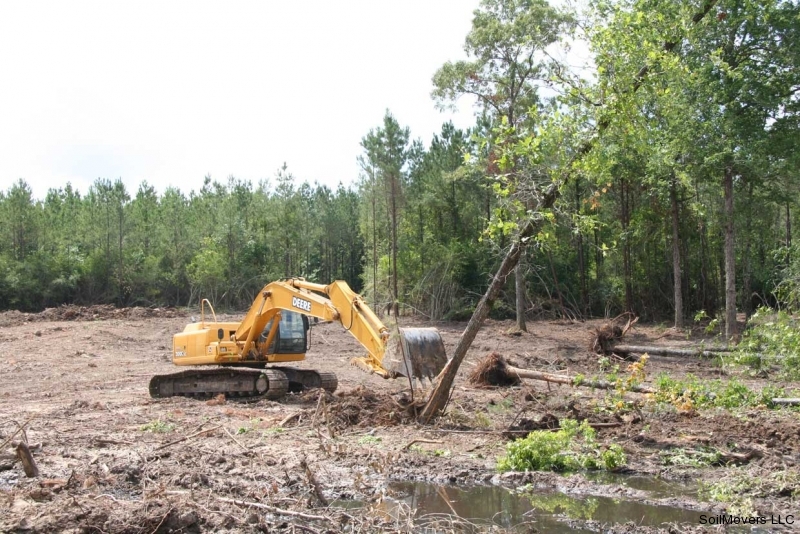 Land clearing begins once the site for the recreational lake is determined. 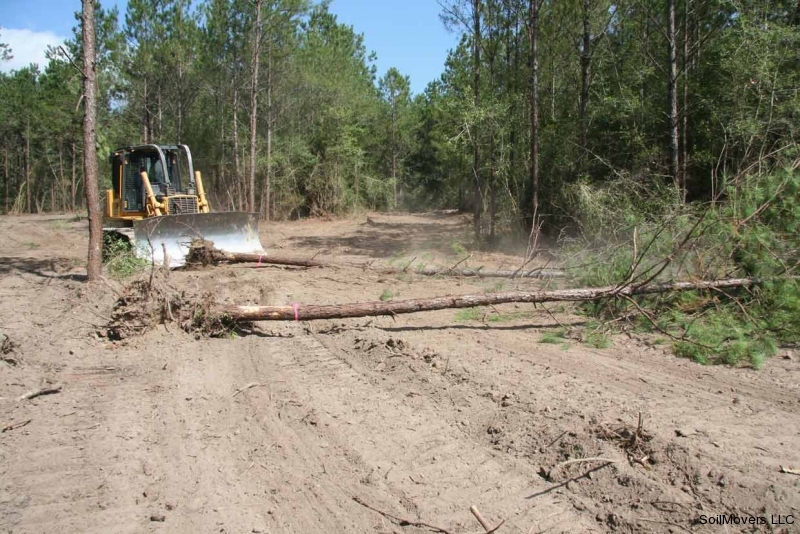 The brush is burned or buried and that decision is determined by expediency and land owner preferences. 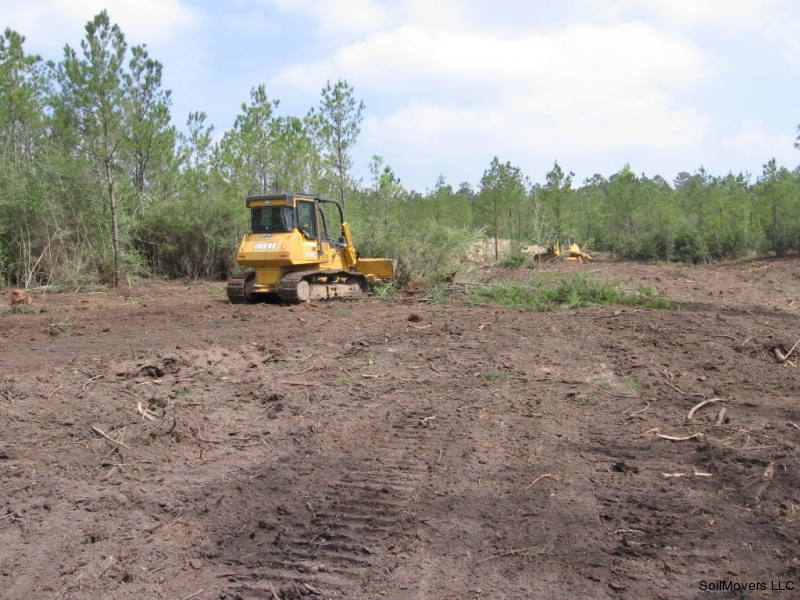 The clearing process is always minimally invasive and as much of the natural habitat is left as possible. 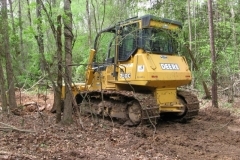 An excavator speeds the process of clearing the larger trees. 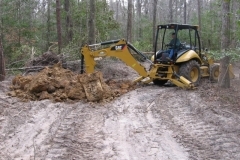 A good contractor has the right equipment for the job. 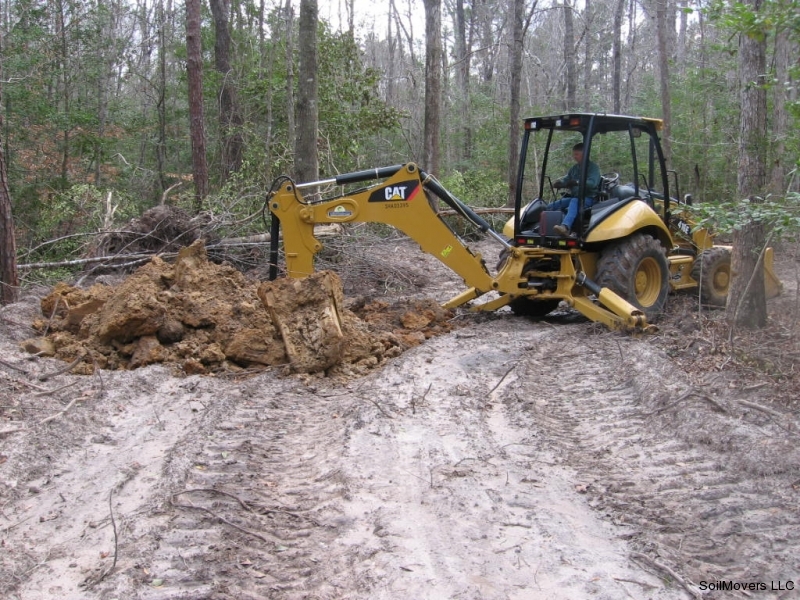 Correct equipment saves time and construction costs for the landowner. 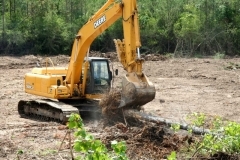 The excavator covers a large area knocking down the trees and the bulldozer comes behind to clean them up. 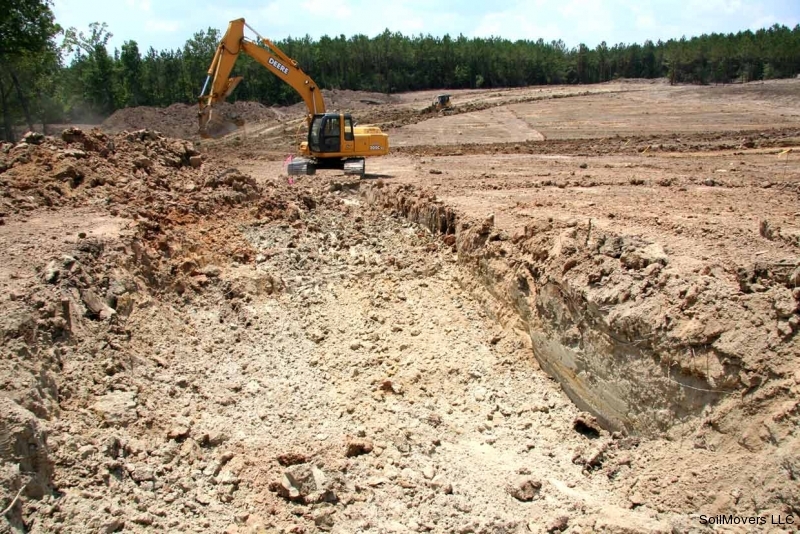 Additional test holes are dug in the proposed lake area to make sure heavy clay soil is present before actual lake excavation begins. 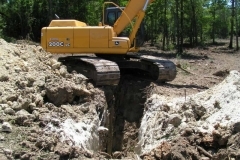 Digging the core trench for a large dam is part of the sound engineering process. 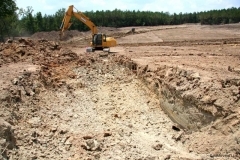 The trench will be filled with heavy clay to firmly anchor the very large dam. 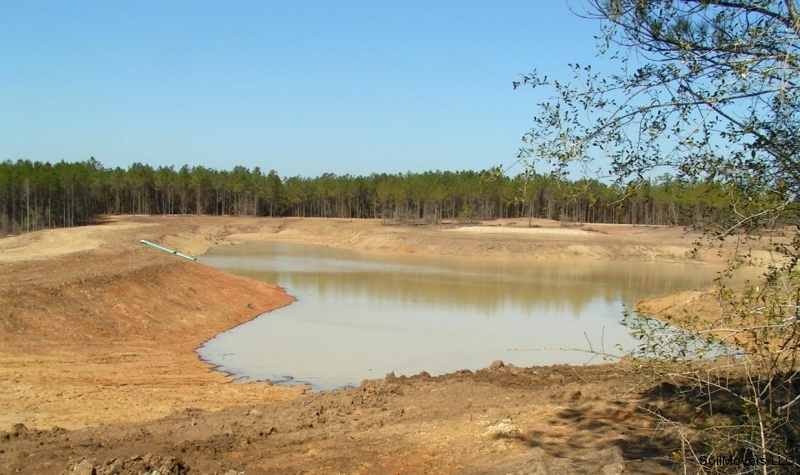 The large East Texas recreational lake begins to take shape. 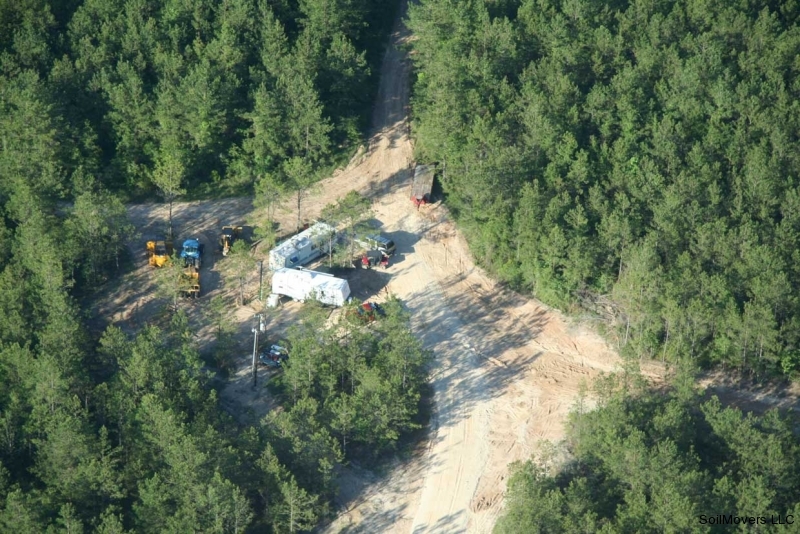 The RV Basecamp aerial view. The property owner has moved his travel trailer in to this location and spends many weekends here with his family as the lake construction progresses. 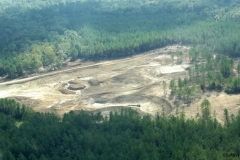 An aerial view of the future recreational lake site with about 3 acres cleared. 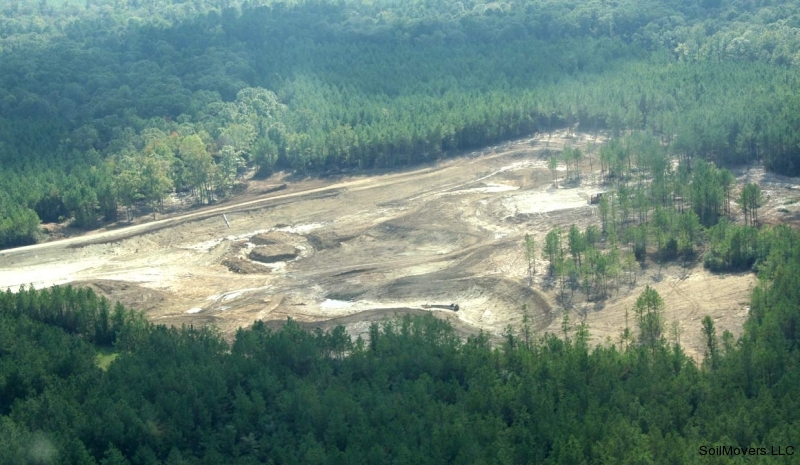 The excavator covers a borrow pit that has been filled with brush. 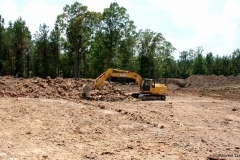 Many cubic yards of dirt must be removed to get to the proper depth. 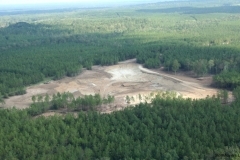 Aerial view as the large recreational lake nears completion. Lake surface area is around 7 acres. 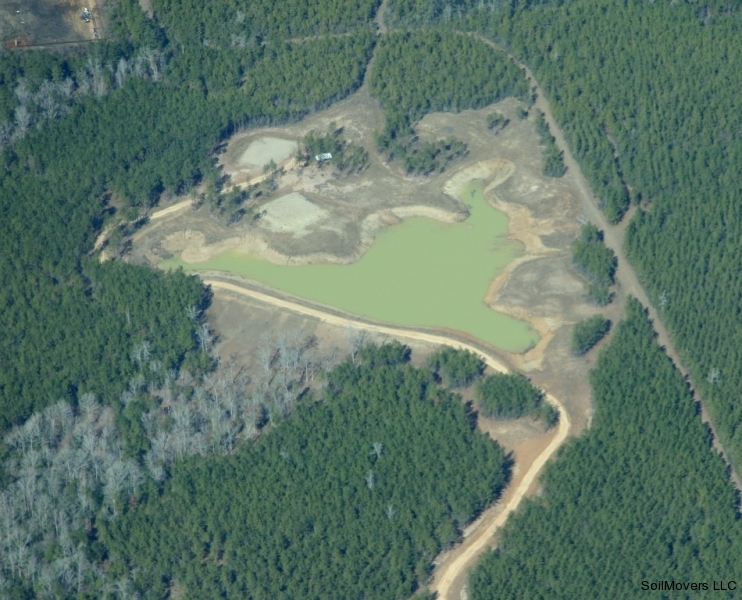 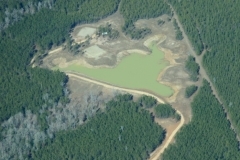 Aerial with earthen dam in foreground. 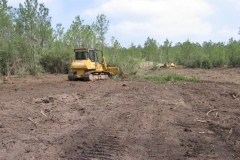 Total cleared area is approximately 28 acres. Narrow interior trails are widened into ranch roads which will be properly filled and graded for drainage. 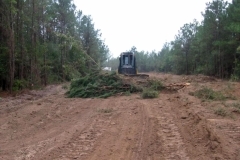 They are then rocked for all weather access. 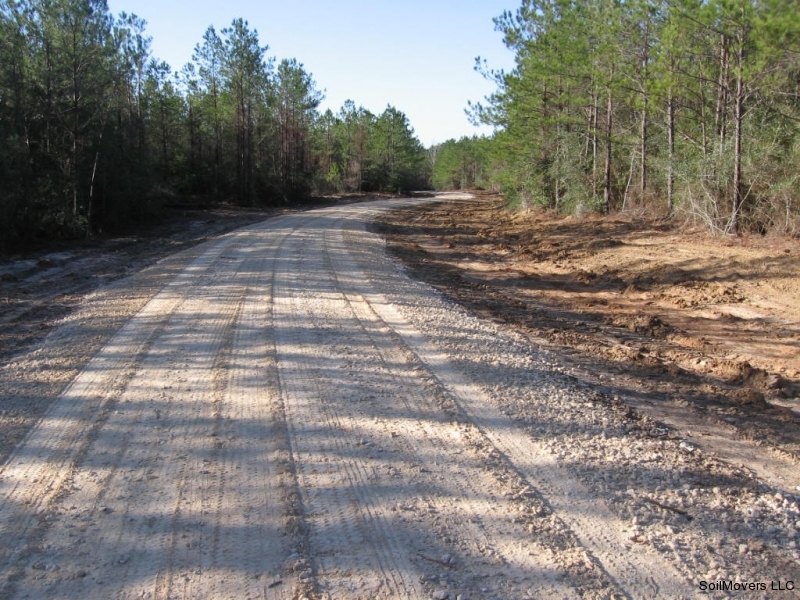 What was once a narrow trail is transformed into a 60' wide ranch road as the lake construction project nears completion. 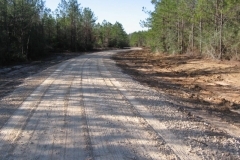 The final grading of the road. 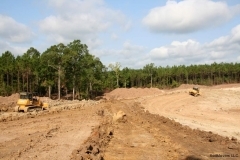 Shoulders are shaped after topsoil is added. 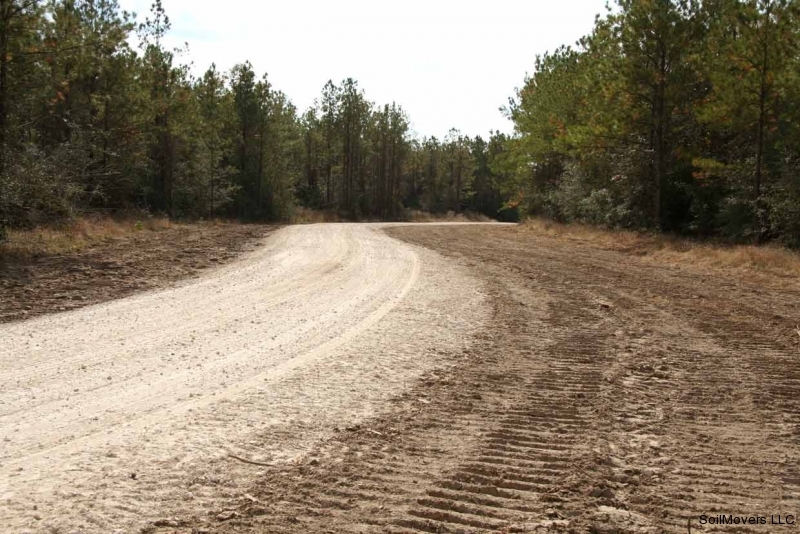 The road shoulders and drainage are seeded to prevent erosion.